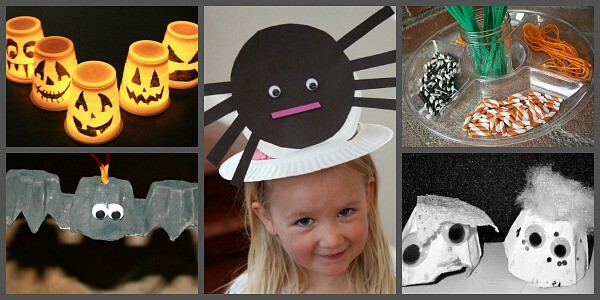 Looking for some easy Halloween party ideas for a kids’ Halloween party? 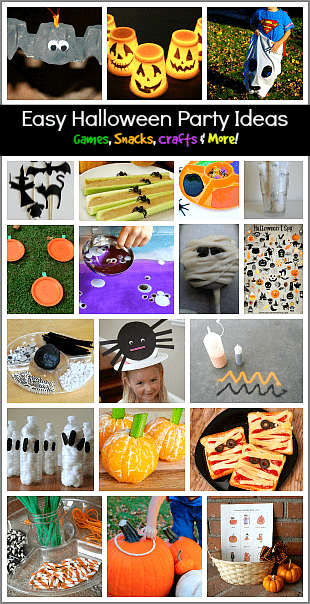 I’ve put together a list of some of my favorite Halloween treats, crafts, games and activities that are super simple. 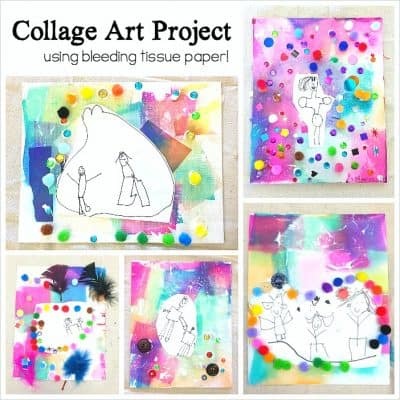 These would be perfect for a classroom Halloween party or one hosted right at home! 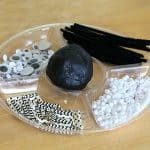 1.You’ll just need a few supplies to set up this Halloween necklace activity! 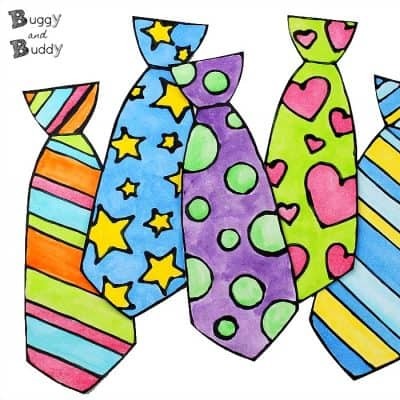 Great for practicing math patterns and fine motor skills too! 2. The kids would love wearing these spider hats around! They look adorable and are made from paper plates! 3. 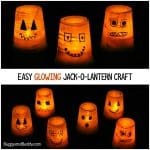 These Halloween lanterns made from plastic cups are so simple and so creative! 4. These silly ghosts made from egg cartons are absolutely adorable and would be great for a wide variety of ages! 5. 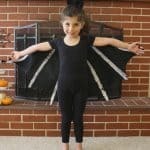 Here’s another fun craft using egg cartons- a simple bat craft! 6. 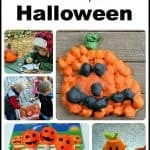 The kids will have so much fun creating with this Halloween playdough activity. You only need a few materials, and the playdough is easy to make! 7. 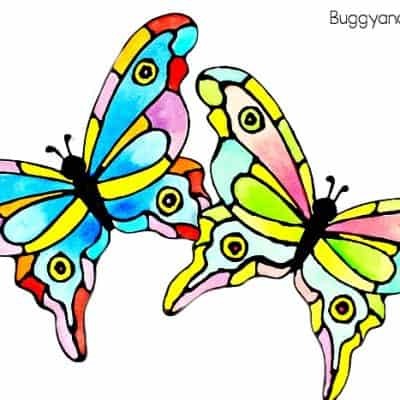 Looking for a creative activity for outdoors? 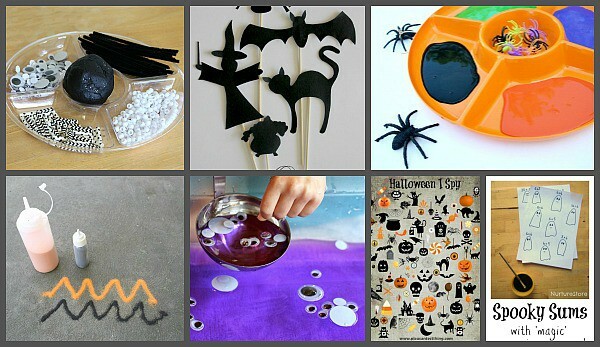 Kids can draw all kinds of Halloween pictures with black and orange sand! 8. 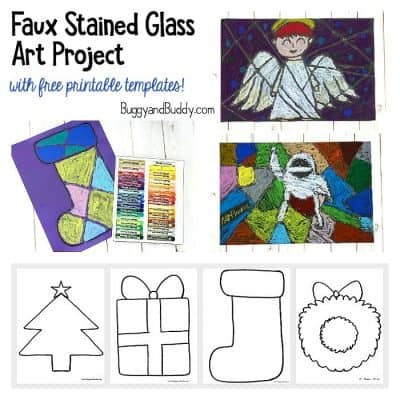 How about setting up a puppet station with these free Hallween shadow puppet printable templates? So fun! 9. 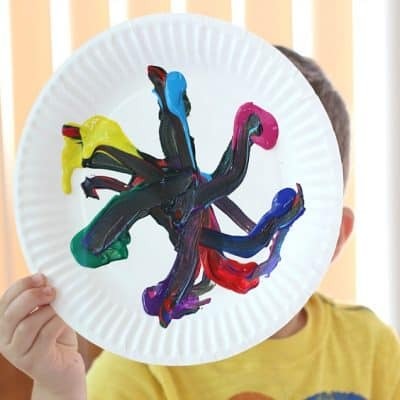 My kids would LOVE this painting with spiders activity– an easy to setup, open-ended art activity! 10. 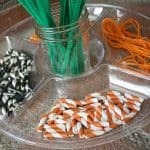 This googly eye soup sensory bin is the perfect sensory activity for a Halloween party! 11. Print out this free Halloween I Spy Game! Perfect for some down time at the party! 12. This spooky sums math activity is a great way to combine math, art, and fun! 13. 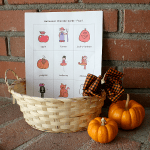 Print out this free printable Halloween charades game and watch the kids have tons of fun acting out all kinds of Halloween creatures and characters! There’s even some blank cards where kids can come up with their own ideas! 14. The kids will love jumping around this ABC Pumpkin Hop game! 15. 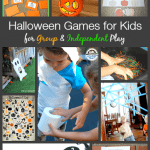 I love this collection of 5 Halloween games– a fun Halloween spin on some classics! 16. 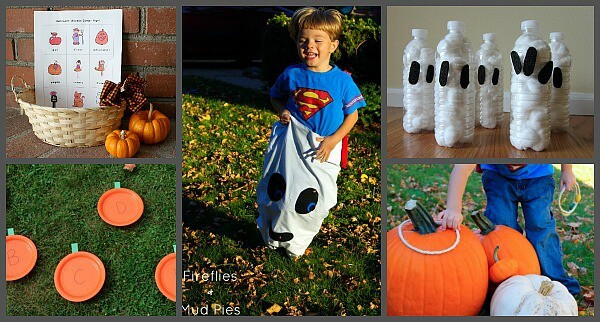 Get the kids moving with this ghost bottle bowling game! 17. My kids would have so much fun helping me make these Oreo Mummy Pops for a classroom party! 18. 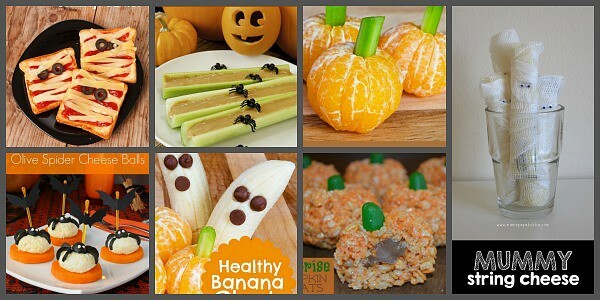 Here’s some great ideas for some healthy Halloween treats! 19. I love this spooky Halloween treat- mummy string cheese! 20. Rice crispy treats are always a hit. I love how these rice crispy treats are shaped just like a pumpkin!